The country manor house at 99 Huckleberry Hill Road was designed by renowned architect Allan Greenberg, and it has been featured in several books and magazines. In Huckleberry House, Greenberg not only designed a classically elegant home but also a timeless masterpiece. 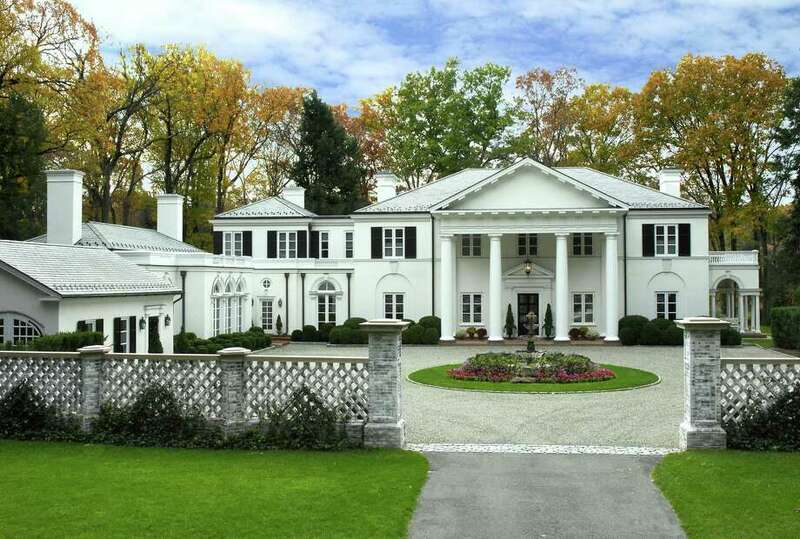 The extraordinary Palladian residence was built in 1982 and Greenberg was responsible for subsequent expansions in 1995 and 2006, which maintained the symmetry of the home and gave it 9,235 square feet of living space. The house has been featured in a number of magazines and books including Classic Modern Architecture by Andreas Papadakis and Allen Greenberg Selected Works. One of its former owner was the late George Lichtblau, most known for inventing an anti-theft device for clothing to dissuade shoplifters. The stucco house is majestically sited on an 8.4-acre estate in a park-like setting with views of a pond along the Silvermine River. A long circular driveway lined in Belgium block leads to the forecourt with a garden fountain where the dramatic two-story façade is a nod to the colonnaded Roman Pantheon or the Maison Carrée in France. This design is repeated in the façade of the 713-square-foot pool house. The in-ground swimming pool and pool house are hidden behind a tall hedgerow and accessed through decorative wrought iron gates. Enter the house and into the spacious reception hall, which provides access into the formal living room and three-story rotunda that doubled as a ballroom for a previous owner. It has a copper dome, fluted ionic columns and decorative molding. Throughout the house there are tall Palladium windows, arched doorways and a vaulted gallery. Many rooms have doors to the large brick terrace looking over the pond. Several rooms, including the formal living and dining rooms, have fireplaces; the one in the dining room has a hand-carved fireplace mantel that is a replica of one at Blair House, the presidential guest house in Washington, D.C. It was carved by sculptor Dennis Collier. The banquet-size dining room also has hand-painted Gracie silk wallcovering with an Asian-inspired design. In the family room the fireplace has a surround of hand-painted Delft tiles, and the fireplace in the second floor master suite resembles Wedgwood luxury porcelain. Also found in the master is a rock crystal chandelier, and there are two others in this 14-room house. In a wing off the family room there is an office and a guest bedroom. There library off the reception hall has polished and hand-rubbed mahogany paneling and two walls of built-in bookshelves. The gourmet kitchen features a large center island with a breakfast bar, Carrera marble counters, built-in window seat, and high-end appliances including a Viking Professional range and Sub-Zero refrigerator. The gracefully curved staircase to the second floor has shallow risers that are gentle on the knees. The gallery at the top of the stairs has a barrel ceiling and cove lighting. In the master suite the hardwood floor is arranged in a herringbone as is the floor in the rotunda. It also has French doors to a balcony. The master bath has a steam shower. In another bedroom there is a fireplace with a carved marble mantel in the neo-classical style. All the baths have radiant heated floors. The finished lower level has a climate-controlled wine cellar, gym with three mirrored walls, a small home theater, and a wet bar in the “hang-out” or sitting room. The 540-square-foot guest house has a living room, kitchen, bedroom, and full bath. For more information or to make an appointment to see the house contact Bonnie Sztam or Rita Kirby of William Pitt Sotheby’s International Realty, Sztam at 917-825-5109 or bsztam@wpsir.com and Kirby at 203-984-7665 or rkirby@wpsir.com.